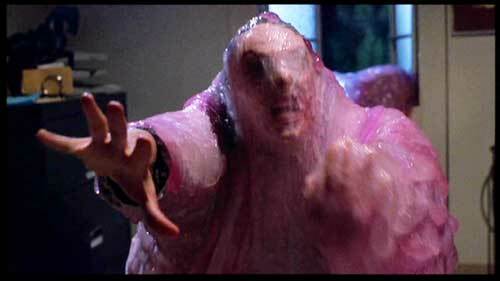 If you are a B horror movie fan, chances are you’ve heard of The Blob. The original is a 1958 teen thriller that spawned a 1972 sequel, Beware, the Blob! as well as a 1988 remake. Each features a set of misunderstood teenagers who witness the amorphous horror that is The Blob. Skeptical parents and authority figures refuse to take the threat seriously, and, of course, a lot of people get absorbed and digested by The Blob. The star of the films is a gooey, slimy mass that crawls around town digesting people and growing ever larger. But what type of creature is The Blob? An explanation was not offered until 1988, when Dr. Meddows reveals that The Blob is the result of a government experiment to create a germ warfare weapon by isolating a virus and bacteria in space. But should we trust Dr. Meddows, who states “Dinosaurs ruled our planet for millions of years and yet they died out almost over night. Why? The evidence suggests that a meteor fell to Earth carrying an alien bacteria.” Dr. Meddows clearly has a few of his facts mixed up. So, what is The Blob? 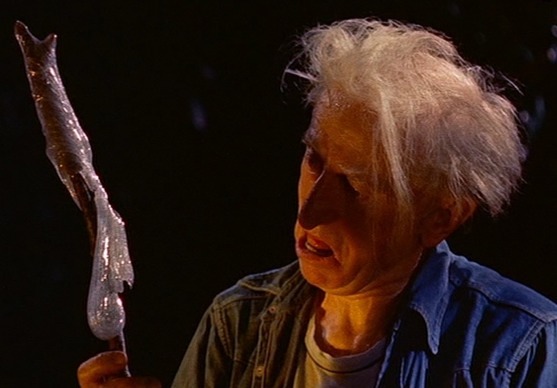 Scientific (fictional) evidence suggests that The Blob is the plasmodial phase of a slime mold! Slime molds may seem moldy, but they aren’t fungi at all! They lack chitinous cell walls, have mobile stages in their life cycle, and digest food whole instead of secreting enzymes like most fungi. Today we recognize slime molds as protists (mostly microscopic animals), not fungi, but because mycologists have traditionally studied them, they continue to pop up in mushroom field guides and mycology textbooks. What does plasmodial phase mean? Slime molds begin their life cycle as a single, mononucleate cell. This cell can switch depending on its environment between a swimming cell with flagella and a crawling amoeba. It swims or crawls around in search of food, until one day it decides to mate and fuse with another single cell. Fusion is what distinguishes the plasmodial from cellular slime molds. Plasmodial slime molds crawl around, ingesting bacteria through absorption and digesting them intracellularly, growing and growing into a large multinucleated mass, the plasmodium. The plasmodium has no cell wall, and no membrane dividing its many nuclei: it is a single giant cell with many nuclei enclosed by a single membrane. Cellular slime molds are actually many single cells aggregating and acting as a plasmodium, but they maintain their cellular integrity. Hopefully you have already noticed a few similarities between The Blob and a plasmodial slime mold. The Blob’s feeding habits are quite like a slime mold. Slowly crawling around, the Blob searches out its food, surrounds it, and absorbs it. Slime molds do the same thing, even absorbing particles they cannot digest and passing them out the other side, always hoping to engulf more bacteria. Is this any different from The Blob absorbing an entire phone booth to eat the waitress inside? Of course, The Blob has evolved to eat people (and kittens), not just bacteria, but this is appears to be a common mutation acquired in space. The Blob’s movement and morphology also strongly resemble that of a slime mold. Amoeboid, it branches out into many finger-like pseudopods in search of food, flowing towards its prey. The video below is of an earthbound plasmodial slime mold, Physarum polycephalum. It has been colored to better resemble The Blob (which ranges from blood red to blue) but earthly slime molds can be a variety of bright colors. Notice how the cytoplasm streams in one direction and then another in a rhythmic tide. This resembles The Blob’s irregular invasion and retreat in the movies, absorbing characters and disappearing from the scene, causing the plot to lay stagnant. Time lapse video of a plasmodium of Physarum polycephalum by Kent Loeffler. We tinted the normally yellow plasmodium blue for a sci fi effect! This plasmodium rampaged around a petri dish for 10 days, engulfing oat flakes. Have I convinced you that my slime mold theory of The Blob is more compelling than Dr. Meddow’s bacteria-virus hypothesis? In addition to being microscopic, bacteria have cell walls, are not motile on dry land, and do not move in a branched manner. Having a virus around would probably kill the bacteria, not mutate them into a monster, even in outer space. It’s far more likely that a slime mold climbed into Dr. Meddow’s experiment due to his shoddy sterile technique, ate the bacteria inside, and acquired a mutation that allowed it to grow larger than a tank and eat people. Many homeowners and gardeners have already made the connection between The Blob and slime molds, complaining about blob-like creatures invading their lawns. They should be thankful these slime molds are content to feed in their lawns, and not crawl inside for tastier prey. The Blob in action in the 1988 remake The Blob. The Blob Site, http://theblobsite.filmbuffonline.com/index.htm. Accessed 10-22-07. Macbride, T. H. and Martin, G. W. The Myxomycetes. (New York, The Macmillan Co.) 1934. Great post, BC. The Blob is a classic. Learned some interesting facts about slime molds. The time-lapse movie is awesome. Your posts are not that frequent but they more than make up in quality and interest. The Blob one is in your best tradition. Your time lapse videos are consistently spectacular. Many thanks for the fun-while-learning you provide. You really do have to be careful of that mold. I love the images you included. This is so hilarious. I had trouble breathing I was laughing so hard. I just discovered this blog and I love it! Thanks for sharing all this info in such ‘easy to consume’ way. To the best of my knowledge, the original Blob movie was based off of real-life accounts of a myxomycete plasmodium. Prior to the 1958 movie, a woman in Texas reported to a newspaper of a giant gooey mass that kept growing on her lawn. She tried to get rid of it but it kept re-appearing. What she probably had on her lawn was *Physarum cinereum* that is frequently found on lawns. This woman’s story was picked up by a tabloid and it was touted as an alien invasion. With that, the idea for The Blob was seeded.